"Finally, a social work practice text that makes a difference! This is the book that you have wished for but could never find. Although similar to texts that cover a range of practice theories and approaches to clinical practice, this book clearly has a social work frame of reference and a social work identity." 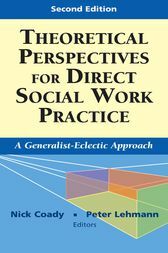 The major focus of this second edition is the same; to provide an overview of theories, models, and therapies for direct social work practice, including systems theory, attachment theory, cognitive-behavioral theory, narrative therapy, solution-focused therapy, the crisis intervention model, and many more. However, this popular textbook goes beyond a mere survey of such theories. It also provides a framework for integrating the use of each theory with central social work principles and values, as well as with the artistic elements of practice.